Heat oven to 425° (hot). Take 1/2 cup pecan halves and chop finely. 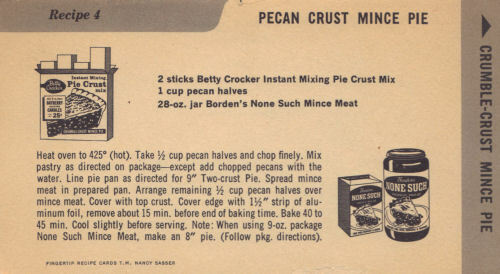 Mix pastry as directed on package–except add chopped pecans with the water. Line pie pan as directed for 9″ Two-crust Pie. Spread mince meat in prepared pan. Arrange remaining 1/2 cup pecan halves over mince meat. Cover with top crust. Cover edge with 1 1/2″ strip of aluminum foil, remove about 15 min. before end of baking time. Bake 40 to 45 min. Cool slightly before serving. Note: When using 9-oz. package None Such Mince Meat, make an 8″ pie. (Follow pkg. directions).